Have I ever told you about the trophy I won back when I was in high school? I’m not very athletic, so I hope you aren’t imagining some sport trophy. If so, you’re going to be rather disappointed, although amused, I’m sure. My trophy proudly displayed a golden pig. Don’t laugh. It had a wooden base and stood about 15 inches tall and there at the top was a golden hog that was probably around 3 inches long. Oh how I wish I still had it so that I could take a picture to show you. Wait – what did I just say? Do I really wish I still had my pig trophy? Why? So that I could use it to decorate my living room? (Precious Moments figurines, family pictures, pig trophy…) Yes, I think I’m glad my golden swine got misplaced. In case winning pig trophies aren’t common where you’re from, let me explain my prize. I was a farm girl and we were involved in 4-H. Each year, we raised pigs to take to the fair. One year, my pig won Reserve Grand Champion. It was a proud moment – and also a little embarrassing because well, what teenage girl do you know that can truly appreciate being awarded with a trophy of a pig? The only one at the fair more excited/embarrassed than me was my brother. His pig took the Grand Champion prize, so his pig trophy was even bigger than mine. Yep, those were some pigs. Kind of makes you want to read Charlotte’s Web again, doesn’t it? That dough recipe may sound a bit familiar. It’s my go-to recipe for Homemade Pizza Pockets, Homemade Poptarts and a variety of other goodies that require a flaky, buttery crust. Mix flour, salt, butter and yogurt together. Knead ingredients together on a floured countertop until the dough is ready to be rolled out. Use a floured rolling pen to roll the dough to a 1/8 inch thickness. 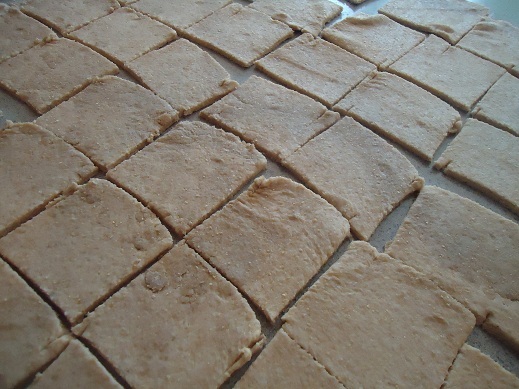 Use a knife to cut the dough into 32 rectangles. 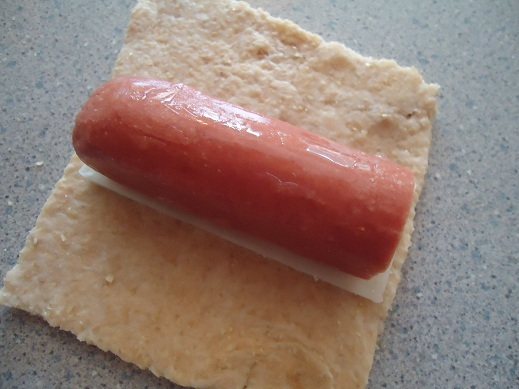 Place one piece of cheese (if desired) and one hotdog half on each rectangle. Roll it up and place it on a well buttered baking dish. Bake at 350° for 30 minutes or until the crust is lightly browned. I’m posting this recipe as a part of our Funky Fresh Kitchen series to remind us all that you can make all kinds of great dishes that are kid friendly and fun AND healthy! Tell me all about your trophies, pigs, brothers, athleticism (or lack thereof), carrot sticks, or anything else remotely relating to this post. Your comment is your entry for a chance to win one of five $10 gift certificates to the Heavenly Homemakers Shop. You know, my husband was just saying he wanted hot dogs…and i haven’t been able to figure out how to do “pigs” in a blanket without crescent rolls. Thanks! :) This will probably be on the menu next week. My kids would LOVE these! They already love the corn dog muffins! I am doing a huge freezer cooking day on Friday before we go to the drag races and I am deff going to be using many of your recipies =] Many batches of bread dough (honey wheat, cinnamon, and few loaves of applesauce bread), Pigs *cough, cows, cough*in a blanket, poptarts, some cinnamon rolls,and some burritos for my hubby, and I am thinking that is it lol. I have a busy day and no children =] Can’t wait to try this recipie!!! Thanks for the recipe. Any ideas on a replacement on the yogurt as my little one is allergic to dairy? Thanks! I think you could use rice milk instead, although you’ll probably want to use less than the 1 cup called for or it may be too liquidy. allergy) and rice milk until it looks right. I was just coming here to post this question. I’ve used your dough recipe for so many things, but we just found out that my daughter can’t eat dairy or soy. Thanks for the suggestion. I can’t wait to make her poptarts again. If you have water kefir grains, you could culture rice, coconut or almond milk and use it In place of yogurt in recipes. It will still be a bit thin, so start with less than the recipe calls for. Laura, I am going to have to try these hotdogs. We have been buying Shelton’s turkey franks, but they always shrivel up and look less than appetizing. Certianly going to try these out! lol, no pig recipes/trophies over here. Not too athletic either, but I love the idea of healthy revamped meals. YUM! I am curious as to why you cut the hotdogs in half? Are they really large? I buy Shelton’s turkey dogs from Azure… but I think cutting them all in half would make my crowd need to eat too many! Could I just make the squares (rectangles) bigger and make a “full hotdog” pig in a blanket? What do you think? You can certainly leave them whole and cut your rectangles bigger without a problem! Laura, as always…. GREAT idea!! my daughter loves hotdogs (we also buy Applegate Farms) and I haven’t been able to find a replacement for the crescent rolls! yay! THANK YOU! One time I was making pretzels using your recipe. The pretzels took longer than planned, so decided I wouldn’t have time to fix what I planned for supper. 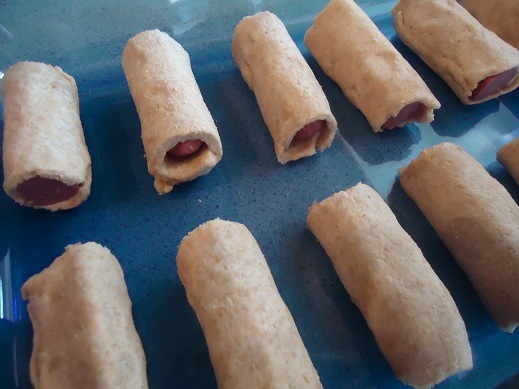 Since I had the dough made up, I came up with the idea to use some of the dough to make pigs in a blanket. They ended up being the best pigs in a blanket ever!!! 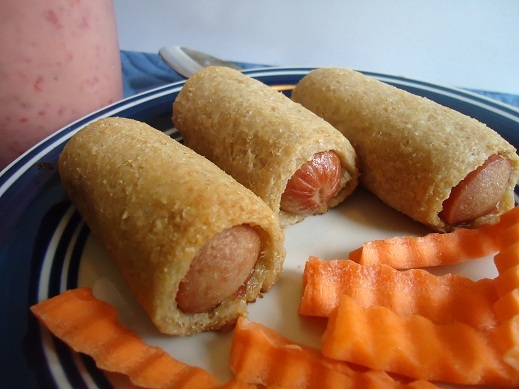 My kids haver never had pigs in a blanket, I’ll have to order done dogs from Azure tomorrow and try them out! I can’t say I received any trophies, or have any athleticism! All your talk of pigs reminds me of the pig-catching contest they had in college. I once won a bowling trophy, which is really a hoot, since I’m not at all a good bowler. (I don’t have my trophy anymore, either.) Your pig trophy must have been much funnier to look at–mine just had a bowler on top. I remember having a blue ribbon for something, now that I read this. But I think it may have been for some reading contest over the summer or something — I really have no idea. Funny what we forget. And speaking of that, my mother has a picture of her interviewing Bob Hope when she was in high school. She had forgotten all about that till she saw the picture again! For me, it was sheep. :) I showed sheep through 4-H. I was on the Sheep Knowledge Bowl even. One year at the fair, I figured out that you could enter the food, even if it wasn’t part of your 4-H project. So, I went down to our blueberry bushes & picked the best ones. I got a blue ribbon for them – and some money too! Our fair paid for blue ribbons in certain categories. I hadn’t done anything special with the berries. I don’t think we ever pruned them or anything. I used to love pigs in a blanket…I’m going to see if my kiddos want to make these…as soon as I get to the store to buy some piggies, err…cows…you know! I’m excited to try this recipe for pseudo crescent roll dough! It looks much easier than the recipe I’ve been using. Thank you for posting it – learning so much from your blog! My hubby eats one (yep, not a typo) hot dog, pig dog, cow dog or any dog only once a year. My kids never had dogs growing up. Well, they had dogs of the barking variety but none you could eat. That is except when we lived in the Azores…now those people at real dogs, yuck! I almost had a trophy once. I was a competitive swimmer “back in the day” and I was awarded second place in one of my races. I even held the trophy for a minute until someone realized they had made a mistake. I was asked to give it back. The poor girl who actually won was crying. How could I say no. We love pigs in a blanket! This will be a nice derivation on the corn dog muffins my kiddos adore. BTW, whenever I serve them that recipe the boys get excited because they get to dig for treasure (little cut up hot dog piece) in the muffins. My grandma actually made trophies and my aunt did the engraving, so I got a trophy for dancing, 8th grade graduation, “for trying” when we came in last in softball, etc…never had a pig one, though! We had blue ribbons for our rabbits and chickens at the county fair. I also got a bowling trophy the one year I was in a bowling league. I might have to try these. Although I usually use turkey dogs. So turkies in a blanket? This looks good, I’ll have to give it a try some time. Thanks for being so creative & healthy! I have a trophy for “best dressed” at City Prairie Days. I was about 7, my face was dirty, my prairie dress was dirty (from playing in the dirt), worn, too small and short and my bonnet didn’t match. My mom was embarrassed to have me enter(she nearly pulled me out). The other girls were all dolled up in their nice, neat, new costumes on(some prairie girls and some call girls). The judges decided that I more closely resembled a prairie girl (from the Laura Ingalls era). I fell about a week later on the concrete and chipped it. I think that trophy is still at my mom’s. I won a grand champonship trophy for showmanship in sheep! I’ll definatly be trying this recipie! This post made me laugh. My husband was a farm boy who got several trophies for his hogs. In the early years of our marriage, I got training in the art of raising hogs. The part about those pigs going directly where we tell them to go brings back memories of all the “fun”. One year, we returned home from July 4th fireworks to find pigs in our garden. They had eaten everything and I was so upset and mad, running around the garden after those pigs. My husband liked to tell people that we had more fireworks when we got home! Just had my first pig in a blanket a few weeks ago and they were good. I can’t wait to try this version. Well, I was not athletic, never won a trophy, and NEVER raised pigs! All city girl. However, I do have a post about my brother. When God handed out smarts I was out picking flowers, so He waited till my brother came along and gave him double. All his life he wanted to be a fireman and a paramedic. EMERGENCY was his favorite show. He loved his job! He passed away a couple of years ago. Loved him… Go hug your brothers and sisters! I was in 4-H once –got a small award for a speech on soil conservation. Way to go on winning reserve grand champion –a very good honor! Those pigs in blankets look really good. In my house, we would call this recipe “Wiener Wraps” ;-) And pigs in blankets are breakfast sausages wrapped in pancakes. I wonder if it’s a regional thing? My son loves corn dogs so yesterday I made him corn muffins with chopped up hot dogs in them. Isn’t it wonderful that we had leftover hotdogs? This morning my early riser daughter and I made your pigs in a blanket. They are in the oven as I type this. Oh, a pig trophy sounds wonderful! Isn’t it funny how we are embarrassed by something at one age, while we are proud of the same thing at a different age? If only you had both your and your brother’s trophy today, you could have lovely, unique bookends for your boys’school books! Try leaving the fat in larger pieces when you cut it in and do not “work” the dough too much, but toss lightly together. This is very much like pie crust or biscuits. The more you work it, the tougher it will become. It is important that the shortening or butter be in pea-sized pieces in your finished product, because the melting of these fat “pockets” in the pastry creates the flakiness. Having the butter very cold when you cut it in helps to keep it in larger pieces as you work with it and roll it out. Thanks!!! The recipe calls for melted butter but perhaps I’ll just cut it in and see if that helps! No athletic awards, but two brothers and myself won the John Phillip Sousa Award in band our senior years in high school. Mom put them all together on a knick knack shelf. 30 years later they are still there. One a different note–these here pigs sound wonderful. My kids have never had pigs in a blanket, so we will definitely give these a try. Thank you for the recipe, the fun, and a good laugh this morning. Love this recipe Laura! I have been a lover of my own version of “pigs in a blanket” for years – made with those hideous canned biscuits and smokies. Thankfully, I can now make a healthier version for Football Saturday! And, I think my son would eat these in his lunch cold. Yeah! Laura, my husband likes his a puffy so I’m wondering if you thought I could use some yeast or baking powder to make the dough puff up a bit around the dogs? Wow, these seriously look amazing and that’s really saying something coming from me, I usually hate hot dogs! Thanks for the great recipe! my kids are going to LOVE this!! I’m going to freeze some for a quick lunch on the wknds. Thanks! I make these once a year at Halloween and make faces with mustard . . . Halloweenies. I love the healthier version! I won swimming trophies in elementary school, but no pig trophies. I LOVE your pizza pockets so I’m sure these will be a big hit as well! I first came to your site when someone told me about your corndog muffins. I made them and have been following you every since them. Thanks for these great recipes. Keep them coming. By the way, I had several tropies in track and field. These sound GREAT!!! I think we will give them a try!!! Could you sub some cornmeal to make them resemble corn dogs? how much if so do you think? not sure how cornmeal works an all.. The recipe sounds great. I only won Grand Champion Ribbons for my rooster. I’ve used this dough recipe several times with red wheat and I LOVE it! I love, love, love the taste of it. I’ve made pizza pockets, breakfast pockets, pizza, etc. My husband isn’t a fan of the red wheat so I might try the hard white wheat, but I wanted to let you know how much I adore this dough recipe! I like to make pigs in the blanket with biscuit dough! I played basketball growing up and had a few trophies myself. Growing up between two brothers meant if I wanted someone to play with I had to play “boy” games. Good memories. I have made this dough to use for poptarts & pizza pockets but never thought of using it for hot dogs. So, I made these today using whole hot dogs to make a sort of corn dog. We enjoyed them with ketchup and mustard. Thanks for the idea. Can’t wait to try these! We haven’t had them in a while since I don’t buy the store dough anymore. This is on my list for freezer cooking =) You think they will do well frozen? Great idea and pretty easy too…might just have to try it! I just bought some local hot dogs this weekend. The kids and I are making these tonight! Thanks. My mom gave me the same recipe. ;) Love it! I may try to make these :) Thanks for the recipe! The only sport I ever liked participating in was gymnastics — I liked the individual aspect of it — no physical contact with others. I’ll have to try these sometime — funny thing is my kids barely know what a hot dog is — we almost never have them…will have to look into ordering some from Azure, thanks! My 4-H trophy had a rabbit on the top. Mine too! And my boys have so many with rabbits, I’m not sure what to do with them anymore! I was very un-athletic as a child. I did play brief in volleyball and softball, but only for one season each. The only “trophies” I have are for music – singing and playing piano/organ. I showed sheep so my trophies probably would have had sheep on them if I’d won one! My sheep were never that good I guess, but I did get showmanship for 3 years (the award for people with less than par animals but who know what they are doing and can smile at the judges). My son shows pigs with 4-H, too. He would love a golden pig trophy. My sons would too! They have golden rabbit trophies, but their pigs have only gotten ribbons! Pig trophies and 4-H are both great things! Those piggies look really good! and is that a smoothie I see in the background…YUM! Those pigs in a blanket look yummy! My boys will love these. I will be giving them a try. I won a trophy for bowling. I think I was in 8th grade…you can tell it really mattered because I file 13’d it. It was a dust collector! I haven’t made pigs in a blanket in ages since I stopped using those pop biscuits in a tube. It would be fun to make these again if I can find ‘healthy’ hotdogs. Look good but I wouldn’t tag them as healthy even if they are handmade! I LOVE this recipe. With football season coming up, I will be sure to try this out! Thanks Laura! Are you kidding me? A pig trophy is the coolest! It always meant more money at market at our fair. I, sadly, never won a pig trophy, but did have a pig in heat that ran around the ring and bit the auctioneers, so that did raise the price per pound a tad. Hubby and I were laughing at the store the other night while purchasing a bag of baby carrots for snacks for a 500 mile drive the next day because they have carrot sticks in a bag that are just like the ones you cut at home. So why not do them yourself??? AND they won’t have that weird plastic bag taste! I know, it was a run-on sentence. sounds good. might have to try it for dinner some night. LOL – you’re too funny Laura! I, too, showed pigs – but with FFA. I was even PRESIDENT of FFA. (Back then it was Future Farmers of America, now it’s just FFA. I don’t really get that, but oh, well.) Never won grand or reserve grand – but I had the champion chester white a time or two. Good times. Haha! Most of my trophies were for softball and basketball, which I played every year until high school. But my favorite one was from my 5th grade teacher, Ms. Merriman. She gave out specific awards to each student at the end of the year. Mine was for being “A silent hero and a friend to everyone.” It meant so much to me (still does, actually) that she saw me that way. This looks great, almost like a corndog. Does it taste like a corndog? I’ve got a story about a pig. My nephew’s family raised pigs last year and named each of them. He became attached to “Famous Dave” and so he will not eat pork from last year unless it is store bought. This year, they decided not to name the pigs. I can’t say I have much to contribute in the way of pig stories or 4-H or sports. I was never very athletic. My kids and I do love carrot sticks! This recipe looks so good! I’m sure I’ll have to try it sometime! My boys will love it! No 4-H here, but there were many in my HS who were involved — in my small home town the schools even took a day off for the fair! These look good and healthy – thanks! I was very athletic but don’t remember ever getting a trophy. How ironic! Shouldn’t these be called “Pigs in a blanket with a side of cow?” I noticed the cheese. Cheddar really does make everything Better (or Bettah as you’d say here in Boston, MA and they’re beef dogs. I do prefer my hot dogs to be all beef or turkey. But then that would be Poultry in a blanket! I also showed pigs in 4-h and sheep what a great time I had and such good memories. Don’t think I ever got a trophy though. Can’t wait to try this recipe. Love this series. Yum and I know the crust is good because I recently made your mini “apple” pies with it. I say “apple” because I used pears in mine and you can’t tell the difference. (pears were on sale) Also I have an award around here somewhere where I won the 5th grade egg drop. My friend and I had the only egg that didn’t break! (it was a group project) The funny part is in order to get second or third place you it was pretty much a judge of whose egg was least broken, lol. These look really yummy. I think my kids would love them! Can you ballpark how many this made? I realize that depending on how you cut it can make a difference, but wondered if this was enough for 2 dinners(we have a family of 6)? or more? This would be fantastic for cooking school with my daughter and great for our busy fall nights. I cut 16 hotdogs in half, so it made 32, which for our family of six made enough for one meal plus leftovers for snacks. I think I will try these instead of the corn dog muffins I was planning for the hot dogs in my freezer. But I wonder if you have ever tried soaking this dough and if it works. I would think you could mix the flour and yogurt and then add the butter and salt later, but I am afraid you would sacrifice the flakiness. Yes, I have soaked this recipe – I actually mix it all up (with butter, salt and everything) and soak it – then roll it out the next day. Works great! My husband and I would like to raise pigs to butcher. Didn’t realize you use this dough recipe for your homemade poptarts. Ahh how I’ve missed poptarts! My kids haven’t, because they’ve never had them… but me? That’s a diff story. Now that I know how easy the crust is (b/c I made this crust just this week actually for pizza) I might have to indulge on some “healthy” poptarts. wow such great pictures and talent wish my mom was as talented at cooking as you. I just popped a batch of these into the oven (using some Trader Joe’s little smokies-style beef sausages that I was able to pick up the last time I drove through ABQ) and BOTH of my younger kids (age 12 and 10) stopped in the kitchen and pleaded to help. I wound up doing pretty much nothing but putting their little masterpieces in the oven! I don’t know how they will taste, but it was a great morning in the kitchen! Making the pigs today for lunch. Then I am going to scour your site looking for help with my son’s horrible eczema. Adorable! My kids would love these. I will have to try your “go-to” dough recipe! oooh this is my son’s favorite meal, although we usually use croissants. i’ve been really disappointed, as we had to stop using pilsbury since their croissant dough contains red 40 (I wish I was joking!) so this makes me really happy that i can make his favorite meal healthier!! woo hoo!! I buy Applegate hot dogs, too. Can’t wait to try this! these look great! i loved these growing up and am happy to have a healthier alternative. I get Trader Joe’s all beef hotdogs, Nitrate, Nitrite, Nitrote (I like it!) Free! This looks like a great meal, as well as great leftovers! Thanks so much! I’ve been looking for a “healthy” substitute recipe for these for a long time. When I saw your recipe, I knew I’d have to try it! Thanks! I’m looking forward to trying these for lunch this week! I bought the hot dogs for these yesterday. We used to call them “Hidden Hot Dogs” when I was a kid. I remember my mom fixing these for us when we were kids! It was a pretty inexpensive meal for 5 children…but not as healthy as your recipe. Thanks for this!! So easy and we will be having pigs in a blanket again!!! I thought I would never be able to have them again!! YAY!! This is my new go-to dough recipe! Thank you so much for this recipe. We’ve been really enjoying it, the dough is great to work with too. We’ve made the dogs, pizza pockets and the pop tarts. We’ve got a name suggestion for you, we call ours snuggly dogs. Then you can miss the whole “what meat is it?” deal. With Halloween around the corner (although we’re not “into” Halloween at all, these are so cute! ), you can make mummy dogs. Cut the dough into stips and wind around the dogs (leaving little spaces open is great) and leave a little opening for the eyes (two little dab of mustard). Imlove this recipe! I use it for making quiche too! I love this recipe! I use it for making quiche too! Can you do the dough in the bread machine? Is this freshly ground flour or store bought wheat flour? I find the measurements needed to make dough a little different if I grind the wheat at home. So just needing some clarification. Looks yummy and will try. Thanks! I use freshly ground flour from hard white wheat. Yum, that sounds like a great idea! Yes, I think it would work just fine to make them ahead! When you freeze these after they’re baked, how long and at what temperature do you reheat them in the oven? Thanks! I would reheat them at 350 for about 10-15 minutes. What can I substitute the yogurt with? I can use vegan butter, but not sure what to use for the yogurt. We found this recipe a few months ago, and I have to tell you–it’s a family favorite now!My 4 year old son picked this for lunch on his day of the week. We make them using a slightly different process (no rolling out). I love how they freeze! We need to try these. My oldest son would love these since I haven’t bought these since trying to eat healthier this year! I’m watching a local talk show making mummies -store bought crescent rolls cut in strips wrapped around hot dogs. I know we love this recipe already, so I think I’ll try it and make mummie dogs tonight, just healthier than the TV version! Sound yummy waiting to try them. Would whole wheat pastry flour work as that’s what I have at home?